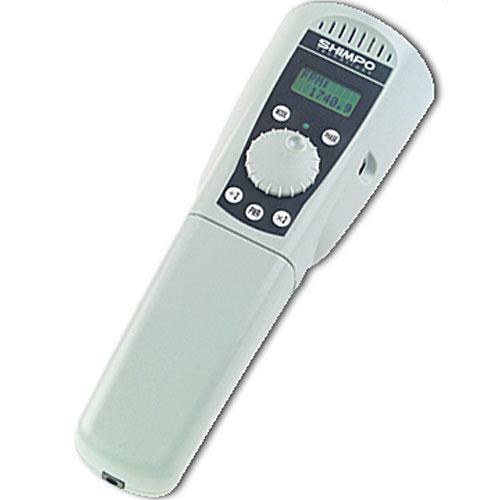 The TechStrobe from SHIMPO INSTRUMENTS is the perfect tool for slow motion or stop action stroboscopic inspection. The SHIMPO TechStrobe is the only palm size unit to include a phase shift feature. Phase shifting allows the TechStrobe operator to advance or retard the flash timing by degrees of angle, without changing the actual flash rate (FPM) of the TechStrobe. Employing its unique phase shifting feature, the TechStrobe “freezes” rotating or reciprocating machinery for visual inspection of covered gear teeth, shafts, oil/fuel/ink injector patterns, and print media; all without stopping production. The TechStrobe is completely portable and operates up to 2.5 hours at 1600 FPM from its detachable, rechargeable battery. The ergonomically designed battery serves as the padded grip area. The battery is quickly detached and recharged while another battery is snapped into place. Designed for right or left hand operation, all TechStrobe functions are intuitive and easy to use. Quality and maintenance professionals will appreciate the rotary and push button controls for internal flash (FPM/RPM) control, external triggering, tachometer mode and phase shift control. The push buttons rapidly increase (x 2), or decrease (÷2) the flashes per minute (FPM) and change by degrees the flash phase. Compact, impact resistant and rugged, with that balanced feeling for one-handed operation, the TechStrobe will quickly become one of the quality and maintenance professionals’ favorite tools. Shimpo PBH-900 Padded Belt Holster for DT-900 Techstrobe Stroboscope. Spare battery pack with built in charging electronics. Used for DT-900 model stroboscope.